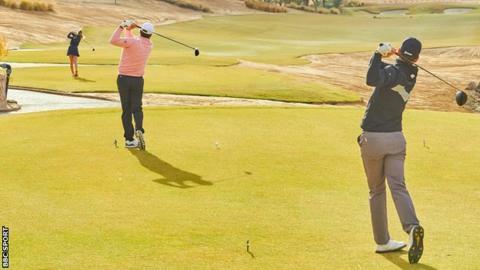 The inaugural Jordan Mixed Open could be "a blueprint for the future of the game", says former Ryder Cup player Barry Lane. Lane will be one of the seniors from the Staysure Tour who will compete against Challenge Tour and Ladies' European Tour players from 4-6 April. "It's something different, and for more people to engage in golf that's what we need," said the 1993 Ryder Cup player. "We've got the Golf Sixes matchplay which is good fun, we had the Vic Open combined tournament in Australia that worked well, and now this event in Jordan. "It's like T20 and Test matches in cricket - a different idea. I don't think we would want it every week - there is a place for traditional 72-hole tournaments - but we need innovation. "It should be something that appeals to a wider audience and hopefully gets youngsters engaged." The Staysure Tour - formerly known as the European Senior Tour - is played by males aged 50 or over, while the Challenge Tour is the second tier of men's professional golf in Europe. "Sport should be inclusive, and different sexes playing against each other is only right," Lane added. "It could work absolutely brilliantly and will hopefully be such a good showcase for the concept that it is followed by more events around the world." Players will tackle the Greg Norman-designed course from different tees depending on the tour they compete on - in 2018 Challenge Tour players drove the ball almost 50 yards further on average than LET players. The men of the Challenge Tour will face a 7,100-yard course in the 54-hole strokeplay event while the over-50s from the Staysure Tour will cover 6,601 yards and Ladies' European Tour (LET) players 6,139 yards.